Do You attend Worship to be Edified, or to be Gratified? I think a lot of people attend worship for the wrong reasons. First of all, our worship is something that we are giving God. It’s not something we’re supposed to be giving to ourselves. Jesus reminds us in Luke 4, verse 8, that “It is written; You shall worship the Lord your God, and serve Him only.” We shouldn’t be trying to serve ourselves in our worship, because we come together to serve God! Now with that being said, in speaking about the Christian worship assembly, we’re given this instruction, in 1 Corinthians 14, verse 26; “..Let all things be done for edification.” Even though we come together to GIVE worship to God, the worship that we give, is designed by God, and I think that’s an important point to remember; That our worship is designed, by God. But it is designed to be edifying to us. To be edified, means to be strengthened spiritually. Worship is designed by God to build up our faith. Not to entertain us, or to build up our emotions, but to build our faith. It’s all about our faith! It’s our faith that’s going to enable us to be saved. Ephesians 2:8 says; “For by grace you have been saved, through faith..” God’s grace, is what provides the opportunity to be saved, and our faith, is what turns the opportunity, into a reality. Jesus said; “Not everyone who says to me Lord, Lord, will enter the kingdom of heaven, but he who does the will of My Father who is in heaven.” (Mathew 7:21) Faith DOES the will of God, and it turns the offer of heaven, into the reality of heaven. And the worship that we give to God, is designed to edify us, in other words, it’s designed to increase our faith, so that we will DO, the will of God. But instead of coming to worship for edification, people like to come for gratification. There’s a difference. To be edified, as we’ve seen, is to be strengthened in our faith. 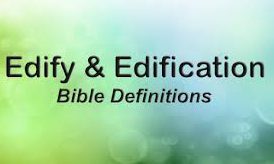 that’s what biblical edification is. But too many people come to worship, for gratification. Gratification is a feeling. It means to be made to feel good. And that’s what most people are looking for; they just want to “feel good”. Here’s some synonyms for gratification.. pleasure, enjoyment, thrill, kicks, satisfaction, indulgence, relief, appeasement. Now, worshipping God, SHOULD be pleasurable, it should be satisfying, and it should be enjoyable. But the desire for those feelings, shouldn’t be the reason you come to worship. You should come to worship to fulfill your obligation to God, and to increase your faith in the process. And if as a result of that process, you also receive enjoyment, and pleasure, and satisfaction, from giving to God, and having your faith built up, then you’ve got a godly attitude! But if your very purpose is just to “feel good”, then you’re not understanding the purpose of worship. What we need to learn, is how to FEEL gratified, by BEING edified. We need to learn to feel good, about learning the word of God, and having our faith strengthened and increased. “Let all things be done for edification..” And if you find that gratifying, then God has blessed you. Be thankful! The instruction to let all things be done for edification, doesn’t only refer to what is DONE in the worship assembly, but it also refers to HOW those things are to be done. Verse 40 sums it up like this; “But let all things be done decently and in an orderly manner.” “Decently” means the same as properly, or becomingly. It wouldn’t be proper, for someone to speak in an unknown language, if there wasn’t anyone there who could interpret what was just said. That wouldn’t edify anyone would it? Even though we don’t speak in tongues today, those of us who do speak during the worship service, should take this example as instruction for ourselves. We should speak clearly, and loudly enough, so that everyone can hear, and hopefully be edified by what we say. Verse 3 of this chapter, speaks of someone who prophesies. And the word “prophesies” there, doesn’t refer to telling the future, but it refers to speaking by inspiration of God. So then, the one who prophesies, has the miraculous gift, of being inspired by God, in what he says in the assembly. Verse 3 says; “But the one who prophesies, speaks to men, for edification, and exhortation, and comfort.” Three things are mentioned there, that were accomplished through speaking the word of God. And as long as we stick to the bible, the words that we speak today, are the same words that they spoke by inspiration, back then. Therefore, the same things that could be accomplished then by those words, can still be accomplished today by those words. Can you think of a particular verse of scripture, where “the word of His grace” edifies us? How about Romans 5:1 & 2? That verse says; “Therefore, having been justified by faith, we have peace with God through our Lord Jesus Christ, through whom also we have obtained our introduction into this grace, in which we STAND, and we BOAST in hope, of the glory of God!” The KJ says; “We rejoice..” But the meaning is actually to boast and to glory! It means to hold your head up high! Now that’s edifying! We are built up to the point of STANDING in grace, and we even hold our head up high and BOAST in the hope that God’s grace gives us! And the word “rejoice”, is actually a good word to use there. Think of it like this; We stand in God’s grace, and we can hold our head up high and rejoice, in the glory of God! That’s what edification allows us to do. Listening to a band play, can’t help you to “stand in God’s grace. And listening to a motivational speaker can’t do it either. Listening to the word of God, that’s the only thing that can make you stand in grace! Oh, but it sure makes me feel good to hear that band play! Well, that’s fine I suppose, but it’s not going to feel quite as good when we stand before the judgment seat of Christ on the last day, knowing that we’ve been standing on gratification all these years, and not on edification, through God’s word. “For I delivered to you as of first importance, what I also received; That Christ died for our sins, according to the scriptures; And that he was buried, and that He was raise on the third day, according to the scriptures.” That’s classic “building material”. Now that’s edifying! And if you want to be built up even more, then you just keep reading verses 35 thru 39; “Who shall separate us from the love of God? Shall tribulation, or distress, or persecution, or famine, or nakedness, or peril, or sword?” That’s a rhetorical question, and the answer is NO, none of those things can separate us from the love of God! That’s encouragement, and edification, all rolled into one. And that brings us to another thing accomplished through the inspired word of God, and that is “exhortation”. Another word for “exhortation” would be the “encouragement”. The word of God, spoken, proclaimed, preached, sung, in the worship service, encourages the congregation. “Encouragement”, in a way, also builds you up. As we saw from those last verses of scripture. And a lot of verses encourage us. For example; Listen to 1 Thessalonians 5:14 thru 24; “And we urge you brethren, admonish the unruly, and encourage the weak. Be patient with all men. See that no one repays another with evil for evil. But always seek after what is good for one another, and for all men.” We’re being encouraged there, to do what God says is the right things to do. And it continues..
You can see the encouragement that God is giving us, through His word. So, encouragement can make us stronger, it can edify us, But another thing that encouragement can do, is to motivate us. Motivation can be the result of encouragement. And if we’re motivated to worship God, and to hear His word, then we’re going to be edified by His word! By the Lord giving us the encouragement of KNOWING, that our labor in the Lord is not in vain, we’re therefore motivated, to BE steadfast, and to BE immovable, and always BE abounding in the work of the Lord. Isn’t that interesting how that works? And if we’re encouraged to be more faithful, then we’ll be more motivated to be faithful. And if we’re more motivated to be faithful, we just might BE more faithful. And the more faithful we become, the stronger we become. And the stronger we become, the more it encourages us. And the more we’re encouraged, the more we’re motivated. And so on, and so on, and so on. God doesn’t want you to just “feel good” about attending the worship service. He wants you to be edified, and encouraged, and comforted. Don’t get it wrong; God surely wants you to feel good, about being edified, and encouraged, and comforted. But if we’re not edified, then it doesn’t make any difference how “good” we feel, because just “feeling good”, won’t save anyone. So if you want your emotions to be built up, go to a concert, or go to a movie, or go to a high school sports event and cheer for your team! But if you want to be edified, come and worship God in spirit and in truth. ← O Worship The King !